Michigan and Illinois will face off one more time on Thursday afternoon after splitting a pair of regular season overtime games. The dramatic home comebacks, or road collapses, packed plenty of excitement, but they were also emblematic of some of the issues that plagued both teams all season. The win probability graphs from both games are eerily similar. Both teams probably feel like they should be 2-0 in the season series, but the truth is that they both probably should have won the games they lost. Thursday’s matchup will pair two inconsistent teams that have their backs against the wall — Michigan to extend its season, Illinois to make the NCAA tournament — in Chicago this weekend. 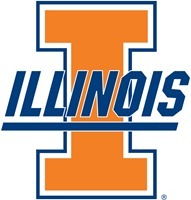 Illinois finished Big Ten play at .500 and sits squarely on the NCAA tournament bubble. The Illini will need to beat Michigan if they want to make the NCAA tournament. Scoring points hasn’t been easy for this Illinois team all season. The Illini managed just 1.01 points per possession in Big Ten play, only good for 11th best, and were the third-worst shooting team in the league. Illinois shot 41.2% on twos (14th) and 35.2% on threes (9th) for just a 45.5 eFG% in league play. Illinois does a great job of valuing the basketball, turning it over on just 16% of its offensive possessions, but it is an average offensive rebounding team, grabbing 28.8% of its misses. 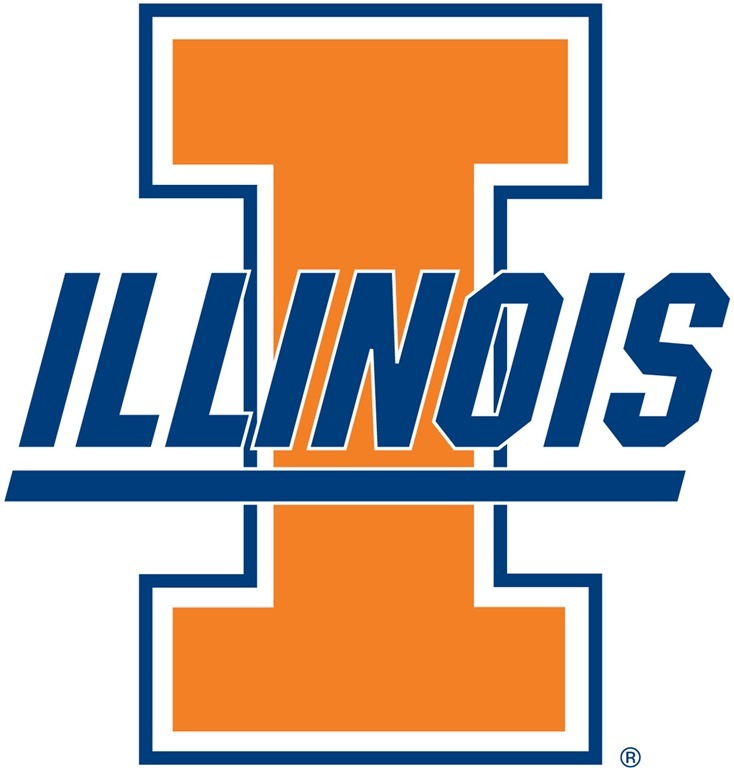 The Illini are the best free throw shooting team in the Big Ten at 81%, but only attempt 31 free throws per 100 field goal attempts. Defensively, Illinois checks in at fifth in the conference, allowing 1.01 points per possession. 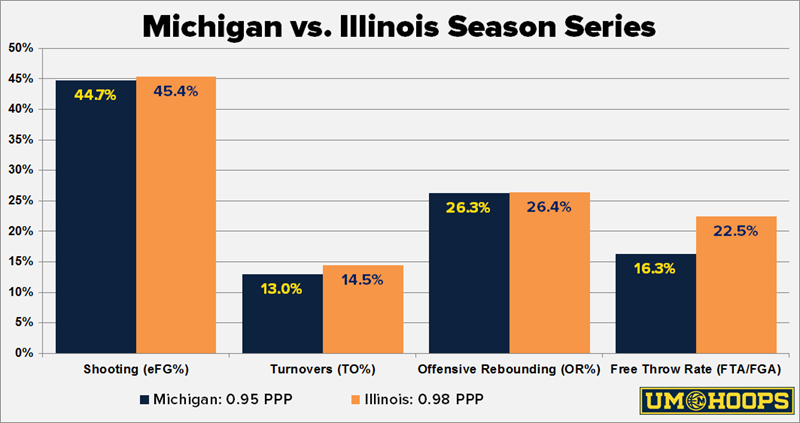 Illinois is aggressive defensively, forcing turnovers on 18.8% of its opponents possessions (4th), and has done a good job on the defensive glass. Big Ten foes have rebounded just 28.4% of their misses against the Illini (4th). 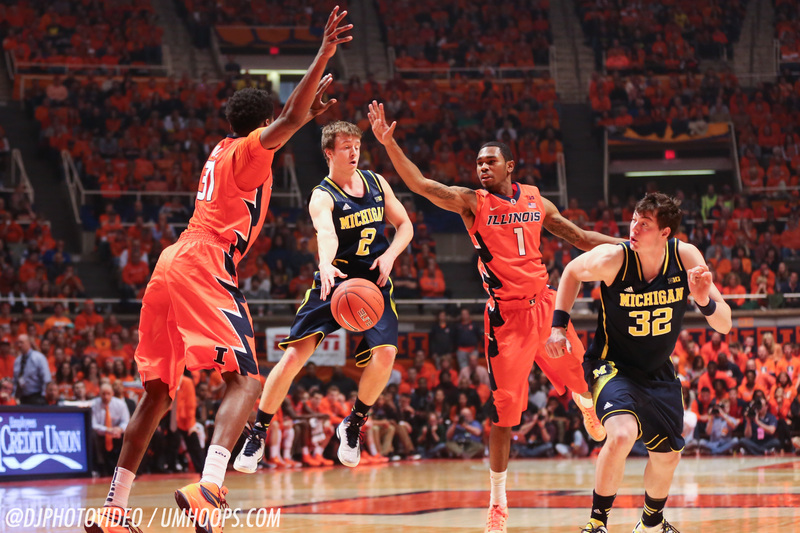 Interior defense has been an issue for John Groce’s group. Big Ten foes are shooting 49.4% (10th) on two-point attempts, but just 33.1% (4th) on threes for a 49.5% effective field goal percentage (9th). Over 131 possessions of head-to-head play, these two teams came out fairly even this season. Here’s a look at the combined four factors graph from both meetings. Senior guard Rayvonte Rice played his first game back from a wrist injury and suspension against Michigan in Champaign and struggled en route to just 4 points on 2 of 7 shooting. Since then he’s been on fire, averaging 18.7 points and five rebounds per game. He’s even 10 of 18 from three-point range over the last three games. Sophomores Malcolm Hill and Kendrick Nunn have both had up and down seasons. Hill has a great mid-range game, can post up smaller players and step out and hit the three. Illinois likes to run a lot of pick-and-pop action with Hill, but expect Michigan to switch 1 through 4 as it usually does. Hill was terrific in the first meeting (19 points on 12 shots) and struggled in the second (11 points on 4 of 16 shooting). Nunn is a spurtable three-point shooter that did nothing for the first 35 minutes of the last meeting before exploding down the stretch and in overtime. He’s only shooting 35% on threes in Big Ten games, but needs to be guarded like a shooter because he’ll get plenty of attempts. Jaylon Tate and Ahmad Starks split time at the point guard spot. Tate is not a perimeter shooter (0 of 8 in Big Ten play), but he can get in the lane and distribute or get to the free throw line. Starks is tiny at 5-foot-9 and isn’t afraid to fire away from three-point range where he’s 29 of 81 (36%) in Big Ten play. Starks was 4 of 5 inside the arc in the last game, so Michigan will need to do a better job of keeping him out of the paint. Given Michigan’s low post defense concerns and Nnanna Egwu’s size, you would think he would have dominated the Wolverines this season, similar to Alex Olah. Instead Egwu has just 14 points on 6 of 16 shooting. Egwu is a capable post-up player but he has the tendency to drift away from the basket and likes to shoot mid-range to three-point jumpers which aren’t necessarily his specialty. Leave the 1-3-1 zone at home: Michigan actually recorded stops on 19 of 31 zone defense possessions in the first meeting (compared to 21 of 32 man possessions), but the 1-3-1 zone was its undoing down the stretch. Michigan probably doesn’t have the horses to play man-to-man all night, but the 2-3 zone seems like the smarter play. Inbound the ball: Michigan’s inability to inbound the ball properly has cost it a couple games this year, including the game at Illinois. John Beilein says it has been a point of emphasis and to expect a few tweaks and it would be brutal to let the season end on a blown inbound call. Finish: Michigan has struggled to finish games all season and those issues were magnified in Champaign. The Wolverines are now fighting to keep their season alive and there’s not a better opportunity to show their improvement than this week in Chicago at the Big Ten Tournament. Illinois has the NCAA tournament to play for and should have a homecourt advantage with the game being played in Chicago. KenPom projects a 62-59 Illinois win and gives Michigan a 36% chance of keeping its season alive for another game. The Wolverines would likely need to win this game to have any chance of making the NIT.